Add salt and whole-wheat flour to the cornmeal and mix well. Add warm water and knead to make a medium soft dough. Divide into eight equal portions and shape into balls. 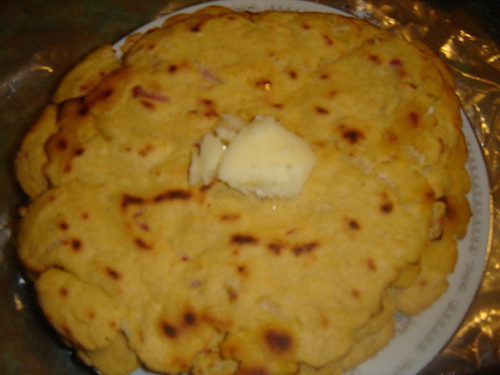 Pat each ball between dampened palms to make a roti of medium thickness. Alternatively, roll out each ball between the folds of a greased plastic sheet. 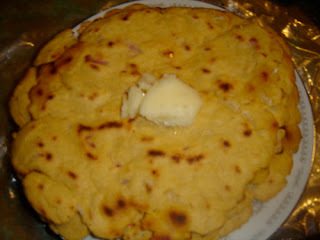 Heat a tawa and place a roti on it. Cook on moderate heat till one side is half-done. Turn over and spread some white butter over the surface. Turn over and spread some more butter on the other side. Cook till both sides are golden brown. Serve hot with a dollop of white butter.